As enterprises experience phenomenal growth in infrastructure virtualization, Riverbed SteelHead® CX (virtual appliance) now provides up to 1 Gbps of throughput to ensure optimal performance across the WAN for remote offices. What you might not know is that in addition to a very light footprint in WAN-optimized environments, SteelHead CX also provides a benchmarking tool for disk performance that helps you determine the target specifications of your ESX servers, to achieve the maximum benefit of optimized WAN traffic. It’s well known that VMware® ESX™ is designed to efficiently manage hardware resources including CPU, memory, storage, and network resources among multiple, concurrent virtual machines. When it comes to deciding whether your existing hardware will meet the performance requirements for a wan-optimization virtualization environment, it’s quite easy to ensure the memory, CPU and network interface card (NIC) resources fit the bill. However, disk throughput can pose slightly more of a challenge on occasion. Disk performance is dependent on factors such as whether it’s a solid-state or spinning disk, whether it’s a read or write operation, to name but a few. To help qualify your environment for a SteelHead CX virtual appliance, Riverbed has provided a simple command to validate that the target model will meet the required disk performance. How can I be sure that my hard-disks meet Riverbed Steelhead CX (virtual appliance) requirements? After installing SteelHead CX on your ESX server, running the disk benchmarking command (‘sportbenchmark’) will validate that the requirements of the SteelHead CX disk performance are met, thus allowing you to proceed confidently knowing that the server is spec’d correctly, to reach up to 1Gbps of optimized WAN traffic with the V-CX7055 model. 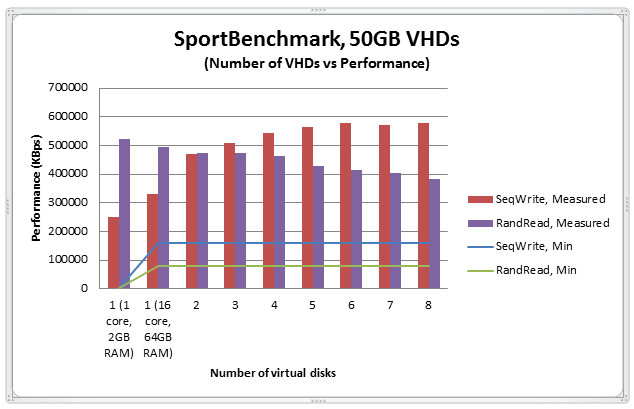 As depicted in the graph below, the disk performance increases as additional 50GB hard-drives (VHD’s) are added within the host ESX server. The first column is using the server defaults (1 core, 2GB RAM) – this is the baseline minimum (disk) performance. Increasing the cores to 16 and RAM to 64GB (second column) significantly boosts the disk-write performance numbers. As more 50G VHDs are added (while keeping the RAM at 64GB & the number of cores at 16) the ‘SeqWrite Measured’ continues to increase (as expected) capping out at the maximum specified throughput. Considering that the minimum required read & write throughput is displayed by the green & blue lines, it’s clear to see that the VHD’s in this ESX server far exceed the minimum threshold, thus preventing any disk bottleneck issue. This disk benchmarking tool for SteelHead CX-v is available in Riverbed SteelHead 8.6.